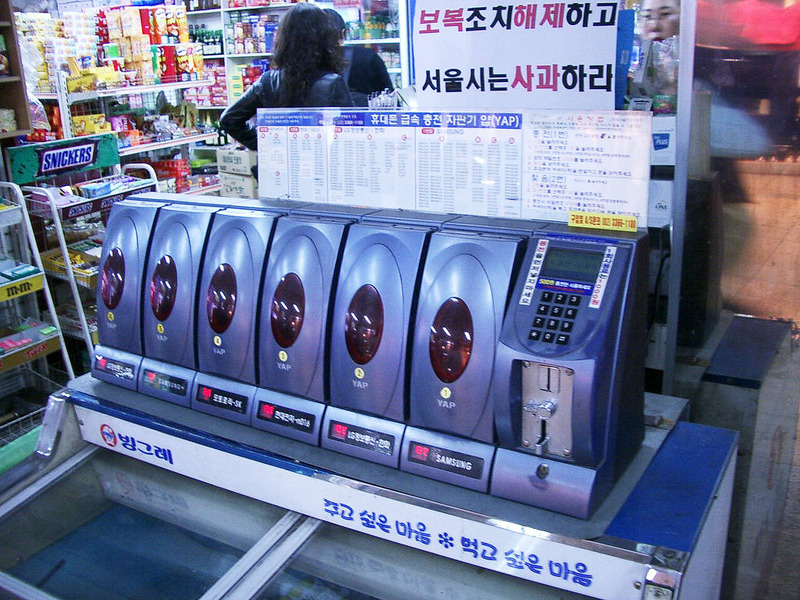 When I arrived in South Korea, I was hell-bent on procuring my own Korean phone. Sadly, hell-bent is all I got. For a traveler, a mobile phone is an immediate handle on a new location. You can use it to call for help, to call home bases like your hotels or local contacts. As you travel, you add people into the phone book, so after a week or two, your phone starts to reflect your time on the ground. I read about travelers struggling to make their home mobile phone work abroad. I've never really tried. 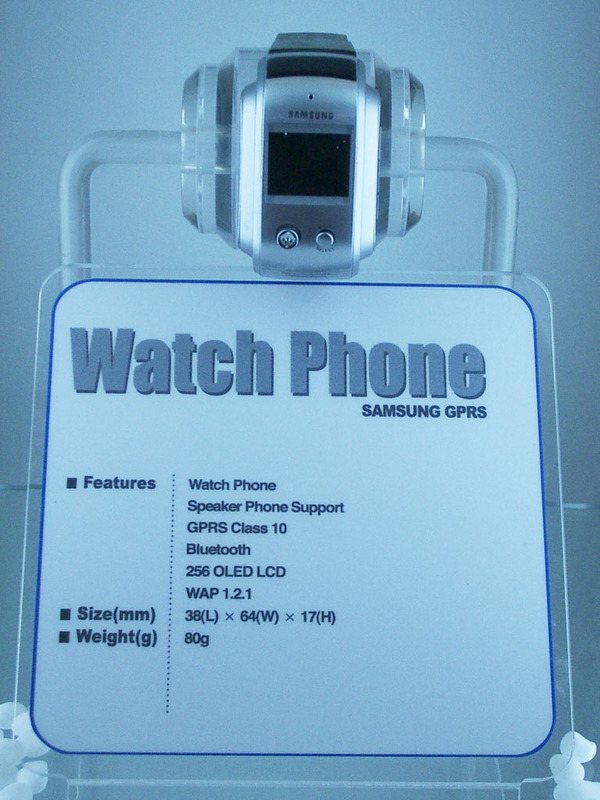 Purchasing a mobile phone in a foreign country can be a good way to take the technology pulse of a new place. And the physical object you take home with you becomes an encapsulation of your social network there. 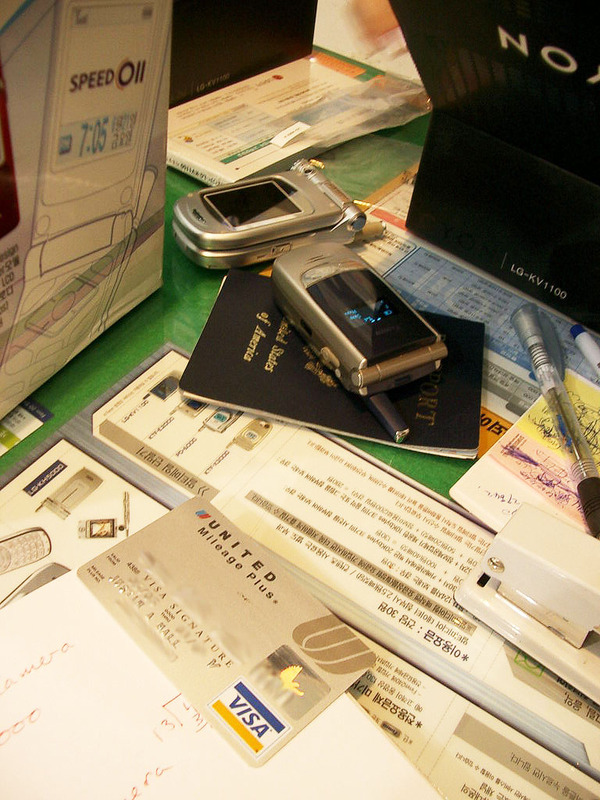 Piles of hot, fashionable handsets, my passport and my visa card - the scene as I attempted to procure myself a phone in Seoul, Fall 2003. As I detailed in TheFeature back in 2001, when I first arrived for a long stay in Japan, I got myself a J-Phone and printed up business cards with my Japanese mobile phone on it. It was a way to quickly integrate with technology-enabled Japanese socializing. They accepted my credit card as a deposit against call and run. They continue to bill me though I've left the country! That's not so keen, but it does mean that I can turn on my J-Phone at the Tokyo airport and immediately arrive back in my social network. I wanted the same sort of arrangement for Korea. I wanted a phone that had a camera, and English language menus - there were plenty of cheap phones with one or the other, but for both, I would have to pay over US$ 500. I agreed, figuring that I'd chalk it up to research. They told me I could by a phone and get pre-paid service. The first phone I purchased, the KV1100 was a sleek black unit with fantastic trim style. Unfortunately, as we were concluding the transaction, my helpful phone saleswoman discovered that SK Telecom, a prominent carrier, wouldn't support pre-paid use of this particular phone. I had to buy a more expensive phone (! ), which they would allow me to buy pre-paid service for. Having spent a few hours picking a phone and making arrangements I consented; I wanted a phone and I figured I'd make reasons to come back to Korea to make use of this growing investment. I almost owned a very stylish, horizontally-aligned Motorola MS-150 but that was not allowed for pre-paid service. 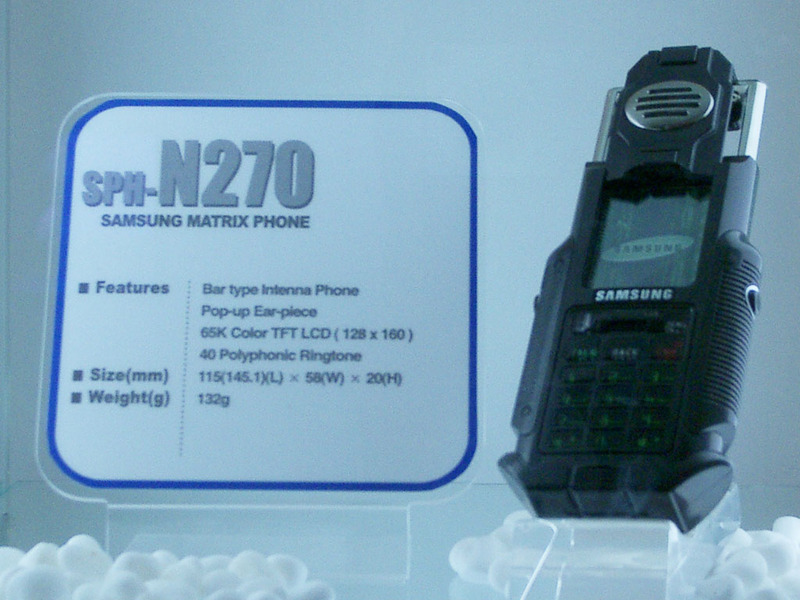 Instead, the cheapest camera and English menu phone, that was permitted for pre-paid, was a Samsung SPH-E2000. That was going to cost me near $600; I swallowed my fear and thought of my readers. The next day, I marched my new top-of-the-line handset over to the largest SK Telecom office near Gangnam. There, they agreed to sell me a basic pre-paid package. I spent ten minutes picking just the right telephone number. I asked to be sure how it could be dialed from abroad. Finally, they took my money and handed me a small card with a scratch-off pre-paid code. In small print, in English, it read: "note: pre-paid phones can not receive calls from overseas. And, any unused credit will expire after 30 days of no use, along with your phone number." I was about as mad as I get when I don't speak the language. People were helpful there and speaking some with me in my mother tongue. But they couldn't really soothe my frustration - after about six hours of wrangling and miscommunication, it appeared to be impossible for me to get a mobile phone in Korea where I could keep the phone number for months of inactivity and receive calls from overseas. That requires a card of foreign residency, I was told. How about a credit card deposit? Take my money when I'm not using your device! Just let me keep the phone number so I can get some Korean business cards! Sorry, sir. We had some trouble with foreigners in the past and now you are limited to the pre-paid service. I might as well have rented a phone at the airport. Instead, I rented a phone at a local mall. On my way out, I told my SK translator, "I'm a journalist, and I intend to share this story of frustration. I want to visit Korea regularly and have a single device holding my social network. It appears to be impossible for me to do that. I hope to push for positive change, to help you support mobile people like myself." They replied, "We think you are one case in a million." Later I was venting to a friend, they said I would have similar difficulties establishing a mobile network profile for myself in the United States if I wasn't a resident here. Note to self: try to get a US mobile phone without proof of citizenship. But Japan, that country has issues with foreigners and still they figured out how to let me have a permanent phone! I pay for the privilege, but I have one! Shimney. The first time I used the Internet this trip to Korea, I paid about US$ .10 for three minutes of time on a net-enabled, keyboard-handy payphone at the Incheon airport. I used it to look up the address of my hotel, which I didn't have elsewhere. I would say it's stupid to land in a foreign country where you don't speak the language, without knowing the address of your hotel. But I wouldn't say that about Seoul. 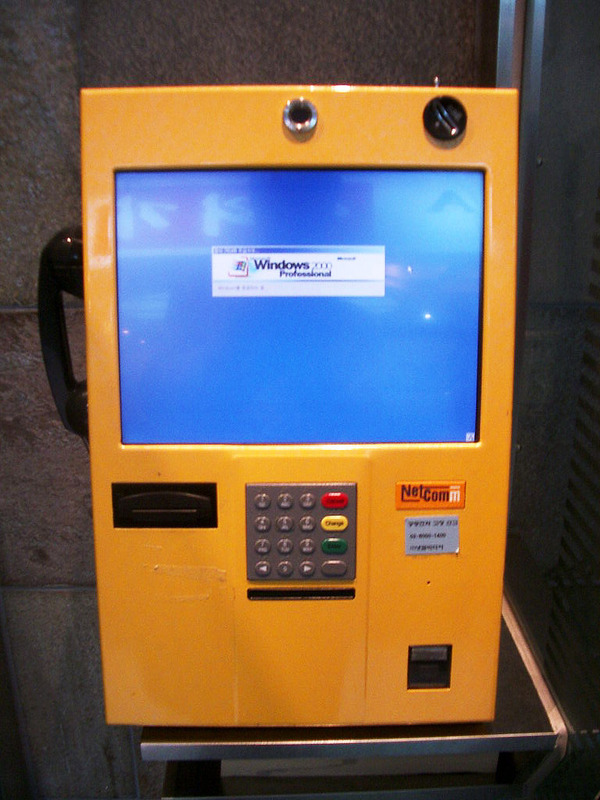 The pain of empowered payphones - a Windows 2000 crash screen on a random pay telephone in the Seoul subway. I was in Korea in part to attend the World Cyber Games, a sort of Olympics for video gamers. I saw the best Halo player beat the second best Halo player. And I watched the gripping CounterStrike finals, where the Swedish Schroet Kommando team handed USA's Team 3D a decided defeat. Here, Abdisamad Mohamed (aka SpawN), one of the Swedish CS team players is using a mobile phone while being watched by a Swedish TV crew. 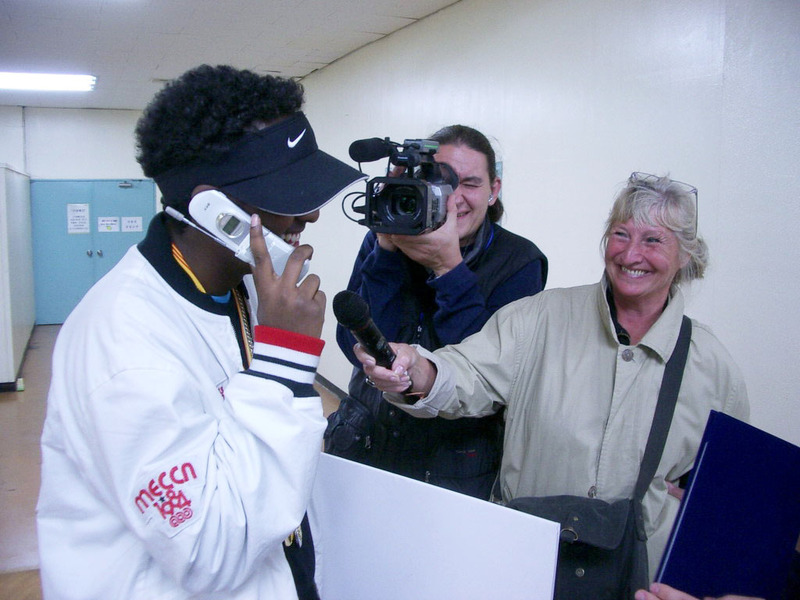 They are filming him telling his Mom back home about his success in gaming, and probably telling her about his share of the US$ 40,000 cash prize. Look Mom! I'm on a mobile phone! From Seoul to Stockholm! On television! An older woman crouches in the subway with her headset during a mobile phone call. 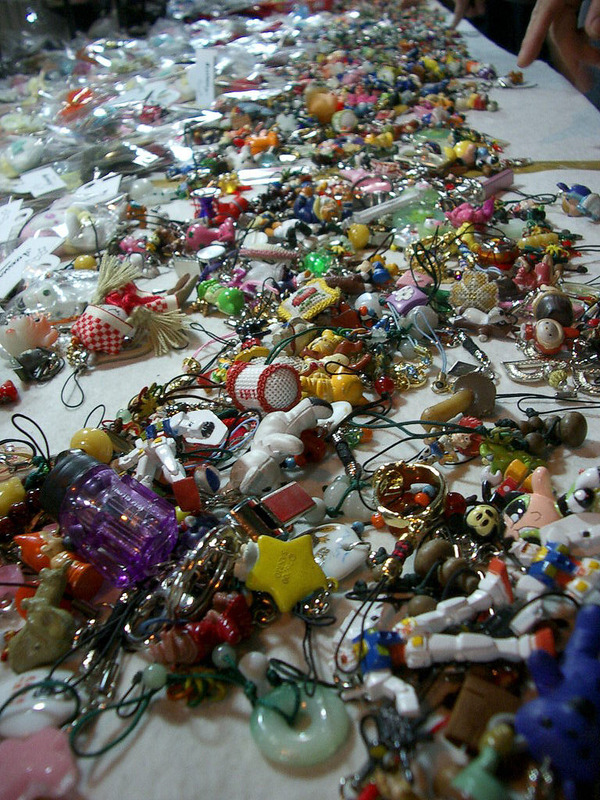 In the trainstation at Gangbyeon, a table full of used phone charms for sale. Seeing all the little animals and robots and religious symbols and good luck charms, baubles in piles, scuffed and dirty, was a sort of sobering moment in the midst of all this neon note-taking. I wondered briefly, were these charms reclaimed where they'd fallen in the subways and on the sidewalks? Were they snatched, perhaps with a pair of scissors, and then restrung for sale cheap? Or were they sold by people who no longer found personal meaning in that particular charm or totem? A row of mobile phone crashpads - if your unit is acting sluggish, buy it a few minutes in one of these fast chargers. This is a sundries store in the subway underpass at Gangnam. 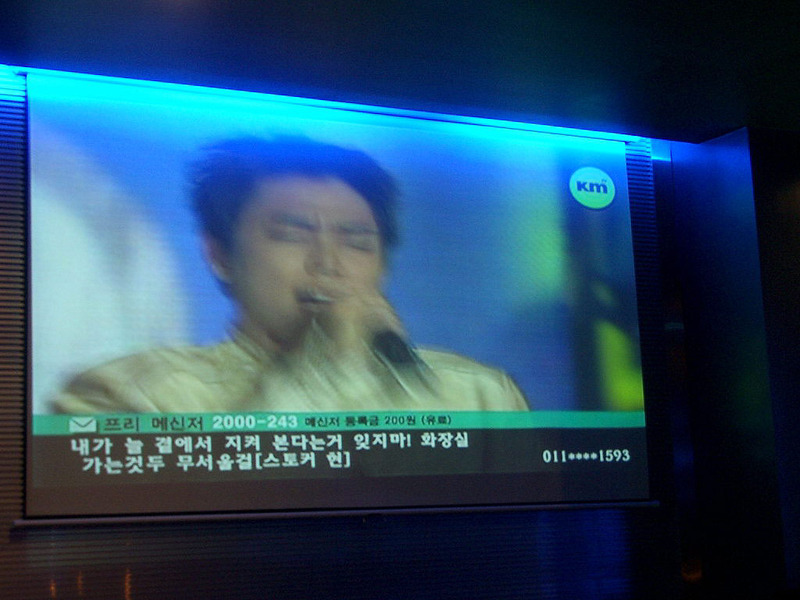 At Platinum, one of the increasingly popular Microbreweries on the new side of Seoul, there was a large screen showing a concert. My host, researcher and writer Jean Kim, explained to me that the lines of text I saw popping up at the bottom of the screen were text messages from fans of whichever group was onscreen. I saw emoticons, hearts and kisses, and lots of fan adoration flowing by onscreen in a script I couldn't read. Sending a text message to the stars, to be viewed on television by the other fans - it would cost you about US$ .20. 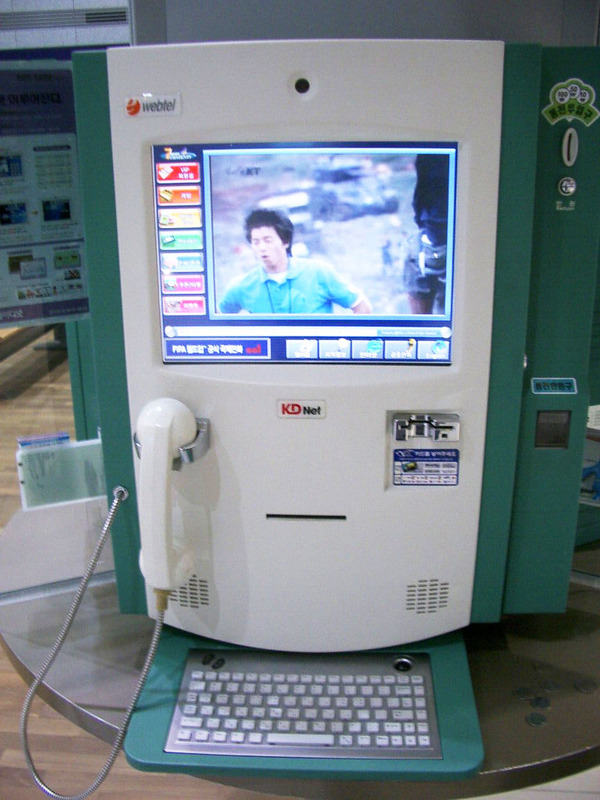 Koreans have used the television to talk to one another before, through phones and in-person appearances: famously in 1983, when the Korean Broadcasting System began a campaign broadcasting information for families divided by the Korean war. What started off as a few folks trying to fing their families through the television turned into a massive national outpouring of grief and yearning. In a five month run, 100,000 people appeared on the air, and there were 10,180 reunions, according to KBS. What might have been possible with mobile internet technology? Technomart is a large mall building with only technology for sale. Geeky stuff like motherboards and chips, and consumer stuff like TVs and vacuum cleaners. 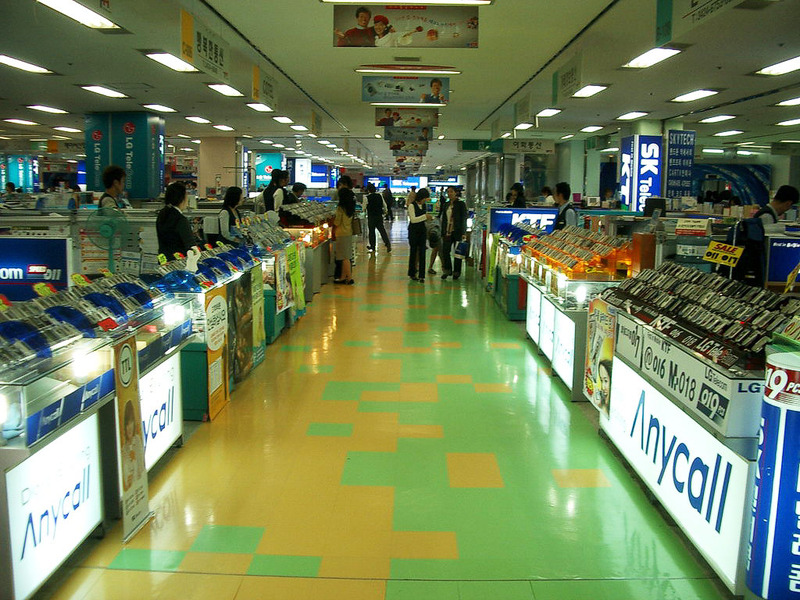 This is a photo taken on the mobile phone floor of the Techno Mart. I used a wide-angle lens, to give a sense of the infinite availability of mobile phones here. There are dozens of little independent shops on this floor, each selling a nearly identical stock of mobile handsets. I mean there's a lot more per capita variety of handsets in Korea, but my mind boggled at the site of so much similarity in variation. 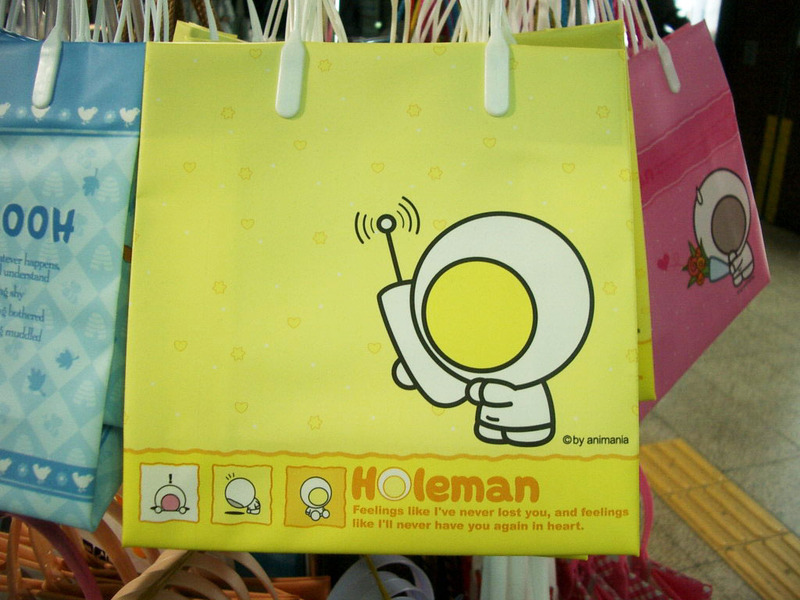 A plastic bag for sale in the Seoul subway. A spaceman with a large circle for expressing himself holds a mobile phone up to his head and utters a meditation on existence extended by telepresence: "Feelings like I've never lost you, and feelings like I'll never have you again in heart." 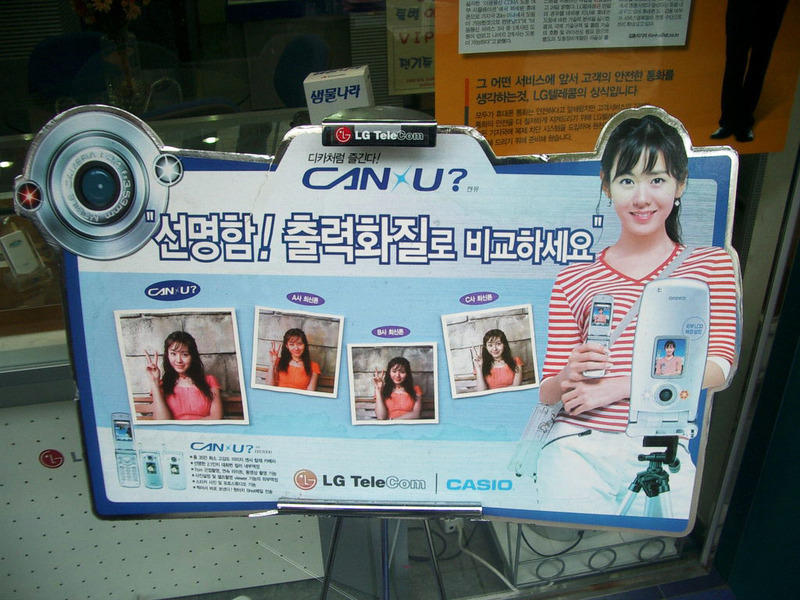 An advertisement for a Casio mobile phone with a camera shows a mobile phone on a tripod. It's a bit of a visual pun really, but how long until phone cameras are worth putting on a tripod for a good serious photo session? It seems silly to imagine maybe, unless you're in post-megapixel phone country. During a tour of the Samsung museum and technology showcase, I spied this refrigerator with a mobile-internet enabled portable tablet PC sitting in its door. Either tap your grocery list directly into your fridge door, or carry the tablet about as you do your inventory. 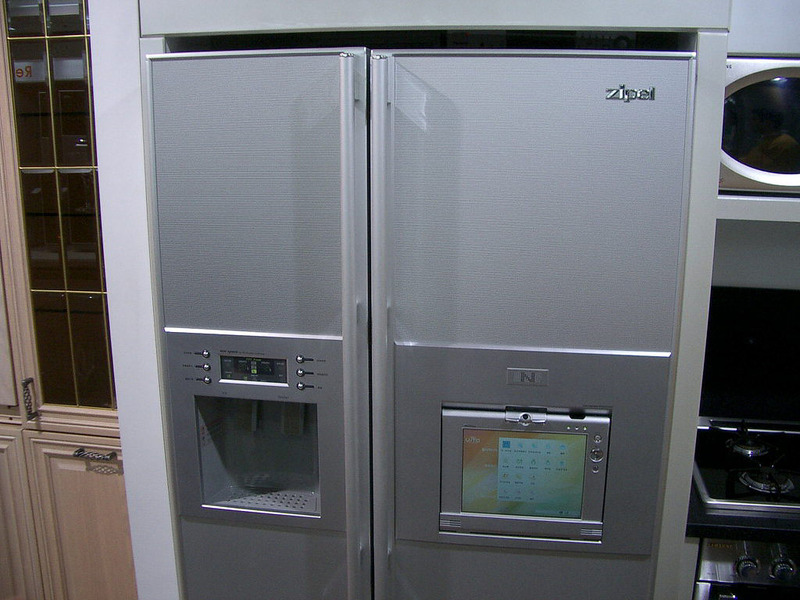 As far as I know, the tablet can not read the contents inside your fridge, but you're likely free to use a UPC code reader to itemize everything purchased and consumed in your kitchen, with this fridge serving as the kitchen data hub. 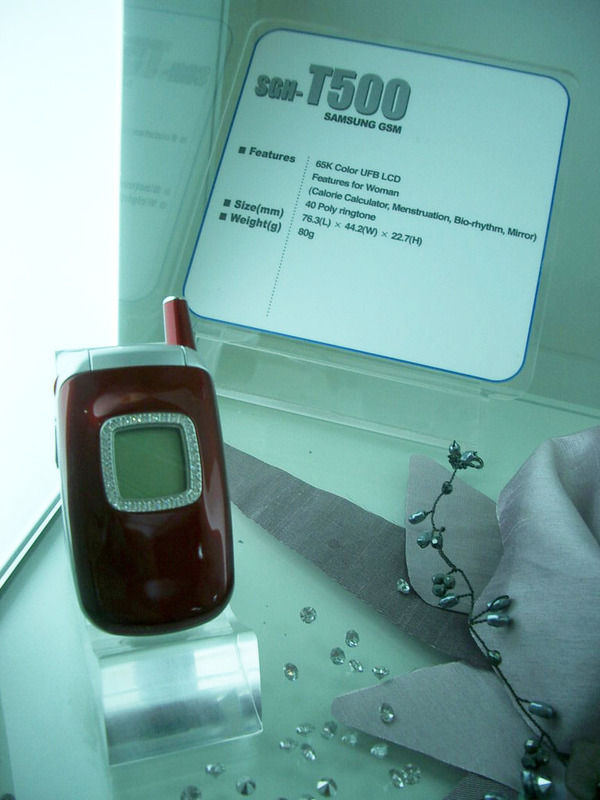 Also at Samsung, the "Ladies Phone" (the SGH-T500) on display between the watch phone and the limited edition Matrix phone. Encrusted with zirconium and pushed firmly towards mobile, active women, the phone is loaded with gendered applications: "Calorie calculator, menstruation, bio-rhythm, mirror." It's always interesting to see how mainstream products are repositioned for niche markets. I'm not sure if this would be a success in the West (or East for that matter) - are women accustomed to updating their devices on their menstrual cycle? I wonder what a dedicated series of mobile male personal upkeep applications might be. More mobile photos and mobile stories from Seoul!